Were you the kind of kid who liked to save french fries in your dresser drawer? Do you find yourself wondering why the zucchini you left out looks like an animal now? Does something in you want to put the molding leftovers back in the refrigerator for another week to see what happens? Do I have a recipe for you! My preserving share this year included 25 lbs of cucumbers, leading to a search for a good pickle recipe. Pickles can be made in several different ways. You can brine them once with salt, then rinse and pickle in vinegar. You can brine them with salt and then vinegar several times over before pickling. You can even go straight to the pickling and skip the brining. Each of these methods will produce a pickle with a different texture and varying intensities of taste, but they all have vinegar as the pickling acid. Can you make a pickle any other way? Why, yes! As a matter of fact, you can! Pickles can also be fermented. Fermentation allows bacteria to produce lactic acid, which in turn kills the microorganisms you don’t want on your plate. It’s a safe and time honored method of food preservation that completely goes against our antibiotic modern sensibilities. 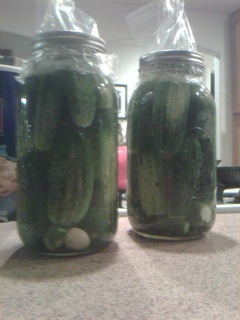 First, you acquire a lot of small cucumbers and two 1/2 gallon jars. You could use a pickling crock if you can find one. Wash the cucumbers and put them into two jars so they are all standing on end. It will still work if they aren’t standing on end, but it’s harder to keep them from floating that way. Make a brine of 1/2c salt, 1/4c vinegar and 8 cups of water. Make sure the salt is dissolved and pour it over the cucumbers in the two jars. The brine should be one or two inches above the vegetables. Cover the jar with a lid or a plastic sandwich bag secured by the jar ring. And then? Then you wait. In fact, you wait for 3 or 4 weeks. Sounds crazy, doesn’t it? At first, they bubble a lot, like soda. Then they form a white scum on the top and a white precipitate starts to cover the cucumbers. As long as they still smell like pickles and the cucumbers don’t get slimy, they are perfectly fine, even if they remind you of that furry zucchini on the counter. I get excited thinking about how remarkable it is that this strange process results in perfectly edible food. When I leave french fries in the drawer, they become less edible, not more. If you want to try fermenting pickles for yourself, check out the USDA Guide to Pickling and Fermenting. It will give you the recipe and all the important details you need to conduct this experiment in your very own home! Note: Do try this at home, but be safe and read the USDA Home Canning Guide 6 first.